There has to be a Number One in every category. When it comes to pot rallies, Seattle Hempfest is the biggest and arguably the best on the planet. The monster marijuana rally — or “protestival,” as organizer Vivian McPeak puts it — is marking 20 years of existence with this year’s event, held at Myrtle Edwards Park on the beautiful Seattle waterfront — and for the first time ever, Hempfest is slated for three days. The party begins at high noon on Friday, August 19 and continues until 8 p.m., then things start up again at 10 a.m. on Saturday and Sunday, lasting until 8 each night. If you’ve never been to Seattle Hempfest before, the energy of hanging out with a couple hundred thousand like-minded people is just incredible. It’s a gentle, uplifting vibe, and not something you ever forget. This year’s event features the legendary Kottonmouth Kings at 7 p.m. Friday on the Parker Memorial Main Stage, sure to be a huge crowd favorite. National Stereo Underground takes the Main Stage at 7 p.m. on Saturday, and local favorites the Herbivores will headline the Main Stage at 7 p.m. on Sunday. Countless other great and up-and-coming musical acts will be featured throughout the weekend, with the Seeley Memorial Stage and the Peter McWilliams Memorial Stage also featuring full slates of speakers and musicians. What this means is that any given time at Hempfest, you’ll have the option of no fewer than three major stages. 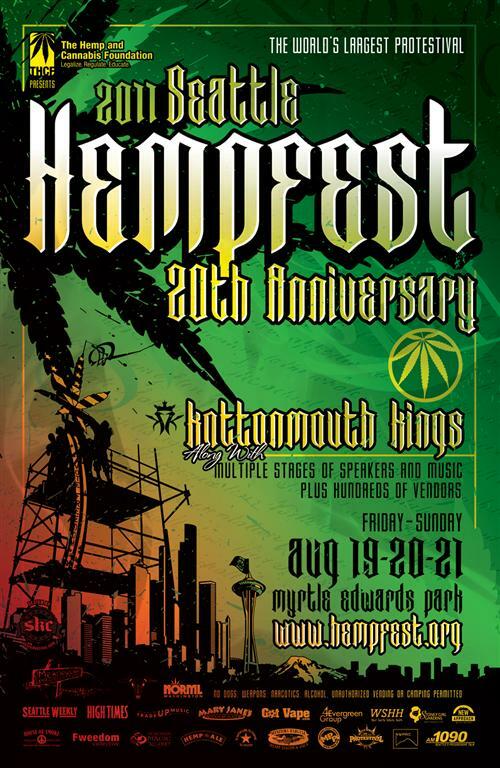 Many of the biggest names in the cannabis movement will be on hand to speak during the weekend, including of course the legendary organizer Vivian McPeak, without whom these 20 years of Hempfest would never have happened. In addition to McPeak, other marijuana luminaries speaking include NORML’s Allen St. Pierre, MPP’s Morgan Fox, Oregon NORML’s Madeline Martinez, KUSH Magazine’s Cheryl Shuman, state Representative and Congressional candidate Roger Goodman, marijuana activist/attorney Douglas Hiatt, Cannabis Culture‘s Jodie Emery, Harborside Health Center’s Steve DeAngelo, West Coast Cannabis magazine’s Ngaio Bealum, Congressman Dennis Kucinich, TV travel host/writer Rick Steves, Seattle Mayor Mike McGinn, Cal NORML’s Dale Gieringer, The Hemp and Cannabis Foundation’s Paul Stanford, the U.S. Marijuana Party’s Wayward Bill, NORML founder Keith Stroup, YEP’s Don Skakie, NAW’s Alison Holcomb, Craig X. Rubin, and the Guru of Ganja himself, Ed Rosenthal — and that’s just to name a few. A number of interesting Speakers’ Panels will be featured on the Hemposium Music Stage throughout the weekend up until 3:45 p.m. each day, at which time musical acts will take over the stage. I’ll be on one of those panels, “Media – From Puns to the High Road,” along with Morgan Fox, Ngaio Bealum, Russ Belville, and Shaun Apple. For more information on the Hempfest schedule, visit the Seattle Hempfest site here.